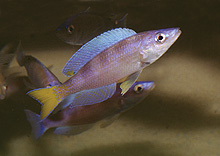 Old World Exotic Fish, Inc.
Why not buy your basic fish food in bulk? Retailer — purchase in bulk and repackage as your store’s special brand name. 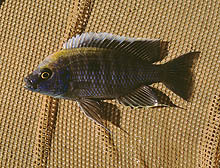 Breeders — why not purchase in larger quantities and split it with other local cichlid hobbyists to keep your costs down? Believe it or not there are some fish food “manufacturers” who merely buy 50 lb bags of stock items from various feed mills and turn around and repackage that same food under their name brand label. You can do the same as the big guys!!! 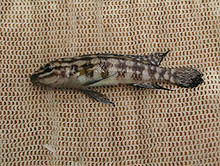 Why not make a profit and reduce your fish food cost by buying in bulk? There are many feed mills across the United States and Canada who manufacture pellet feed in 50 lbs bags. The cost for these fifty pound bags are only $25.00 to $60.00 per bag and can be shipped UPS for an additional $15.00 or $20.00. Therefore, you would be buying for feed for approximately $1.50 a pound, not the usual $5.00 per pound or more! There are several things to look for when you go to purchase pellet food. First, pellet food either is compacted into a pellet under pressure or is extruded after being cooked then lobbed off as it comes out of the machine (like spaghetti). 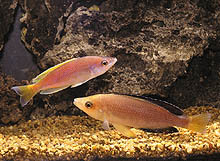 If you want buy a pellet that will be utilized by your fish, remember the pellets will vary in sizes and sink abilities. 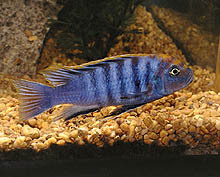 Cichlids have a wide variety of diets that is determined by their habitat and niche it the lake. There are a few things that you must keep in mind. 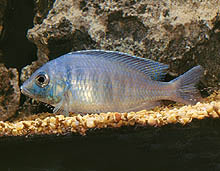 Most cichlids feed of the bottom and in mid-water; you must use a pellet that sinks well. Buying pellets that float is a big mistake. 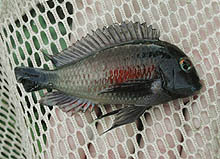 These pellets are injected with air to make them float and thus air is pasted on to the fish that consumes these pellets. Floating pellets will cause problems later. Secondly, make sure the feed contains only about 10% or less of fat. 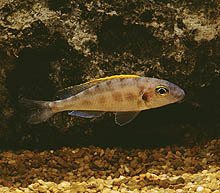 Cichlids do not need a lot of fat in their diet, unlike coldwater fishes such as trout and salmon. You will NOT need a high amount a protein because you are feeding your fish once a day and therefore protein quantities of 30% - 40% will do nicely. 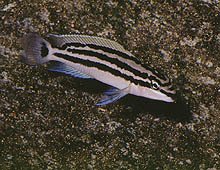 DO NOT OVER FEED your fish with pellet foods. Pellets should be alternated with flake food, freeze-dried items, or vegetable matter. 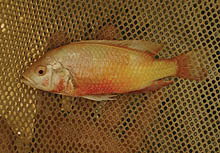 No fish can survive on one type of food. Thirdly, you will need to select the pellet size. 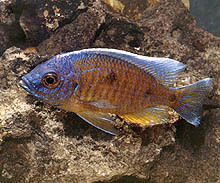 Many pellet feeds will come in 3/32” size and is easily consumed by most cichlids and even fry. 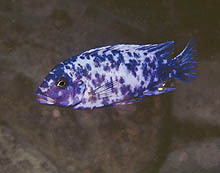 Since they are sinking pellets, they will begin attacking when it softens with the water. A 3/32” corresponds to approximately 2.0 mm, if you wish to use a smaller size pellet, I suggest getting a #2, #3, or #4. A #4 pellet is equivalent to 1.5 mm or 1/16”. #2 pellets and 3/32” pellets are typically stocked sizes at all manufacturers. Most feed mills use a hundred different feed formulas for all sort of aquatic animals, most of which has been formulated by the US government. 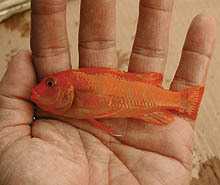 You will only need to find those feed manufacturers that specializes in ornamental fish food diets that are good for goldfish or koi (but are sinking and a standard stock item). If you find a diet that is not a standard stock item, you may need to buy larger quantities to be able to purchase these diets. 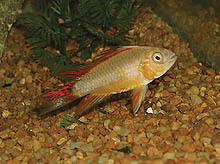 Cichlids have a wide variety of feeding habits, but as a general rule for color and health, a feed formula similar to goldfish or koi pellet will be acceptable. The key ingredients that you need outside of the percentages of fat and protein mentioned above and some sort of spirulina and krill at 1%, 2%, or 3% levels. With the crustaceans such as krill and algae such as spirulina, these two items will bring to life all the natural colors of your fish after just a week or so. Most manufacturers incorporate extra vitamins and minerals in their feeds. One feed mill that has done a lot a work with tropical fish farms in Florida is Nelson Silvercup. 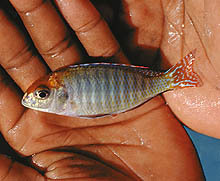 They manufacture a feed called “Scientific 3 Pigment” (62% protein, 9% fat) which is specially designed for ornamental fish and is available is a small size pellet. Nelson Silvercup can be on the more expensive side, however the benefits definitely out weight the costs and this should be a first choice. Nelson Silvercup can be reached at www.silvercup.com or telephone (801) 262-2991. 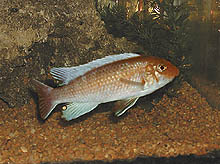 Other fish feed manufacturers that could carry either a sinking goldfish pellet or tilapia diet with spirulina and krill would be the following: Burris Feeds www.burrismill.com, Southern States www.SouthernStates.com, Rangen Feeds 1-800-657-6446. Just go on the web and surf the feed manufacturers and find something your fish are going to relish and you may even make a profit from. Most manufacturers will send you samples for you to try, just ask! Please understanding this will take some time. However, the pay off will be well worth it — educationally and hopefully profitable. 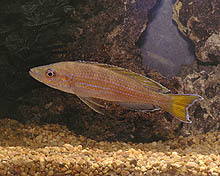 Remember: The best advise is that fish cannot live off a single diet nor be consistently overfed. They need variety for breeding, health, and growth; and they need it sparingly to reduce bloating. GOOD LUCK! 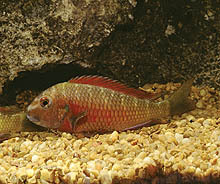 PS: A popular German cichlid color food in the 1980’s was actually Grand Champion Fish Foods – a koi diet! 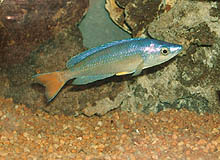 Copyright © (2002-2008) Old World Exotic Fish, Inc.